These are portals and similar intended for end-user like insurance customers or insurance agents. They are usually written in modern portal technology. These solutions make life easier for business users who need to develop new insurance products or perform other business-related configuration tasks. Core applications that contain and manage data, processes and analytics. These solutions are based on mature Oracle technology. These solutions extend Tia functionality and/or ensures smooth data flow between Tia and other services. Tia Agent is a smooth new way of managing traditionally time-consuming processes for any agent who sells insurance policies on behalf of a mother insurer. Using REST API’s for customer, product, claims, payment and account information, agents can enter information and get the right policy price instantly. Why not sell the right customer the right product on the spot? Tia Corporate Self-Service sets new standards for efficient management of large groups of insured people or items. The solution is best described as a self-service portal that grants managers new levels of control when dealing with hundreds or thousands of users on the same policies. The gain? Fast access to master policies, increased automation and customised user interfaces. Tia Customer Service is a front office call-centre function. It is also a direct line to happier insurance customers and more successful upselling. We’ve analysed the core tasks that customer service employees perform and built that knowledge into a one-screen solution with new and improved customer overviews and flows. In short: Real-time control that translates to customer satisfaction. Tia Batch Robot allows you to improve business operations and increase efficiency. Automatically managing batch investigations means you’re able to catch errors as they occur as well as capturing knowledge of system errors over time. You can also autocorrect known errors and apply data fixes to them. The Tia Batch Robot integrates seamlessly into any existing Tia system. Tia Test Automation lets you test your in-house development faster, earlier and more often. When you’re upgrading your core software, it’s essential to be able to discover any unexpected impacts on the system functionality. Now you can quickly and easily test and verify changes to code before they are released into production – and fix any bugs with minimal effort and maximum certainty. Tia Billing gives you the operational efficiency you need to drive down costs and improve service levels. It lets you accurately control money flows and maintain manual authorisations of larger sums. The solution delivers full control of the supporting functions within each of the departments running on Tia. It also automates all standard processes so there is much less chance of human error. Tia GDPR provides a comprehensive solution to GDPR requirements. Tia GDPR is pre-defined, configurable and deployed quickly according to best practice. It also ensures that data integrity in the Tia system is preserved and that the system works seamlessly after deletion of any data. Plus, the solution is future-proof as new features in Tia will include the GDPR requirements. Tia POPIA ensures you’re fully compliant with the 2013 Protection of Personal Information Act. Comprehensive compliance in a pre-defined configurable solution, Tia POPIA ensures that data integrity in the Tia system is preserved and that the system works seamlessly after data is deleted. Tia also takes responsibility for developing, implementing and customising your installation. Tia Sales Product Designer lets your sales and marketing departments create their own targeted products in a matter of days instead of months. In addition to driving product diversification and supporting more strategic product-design thinking in the business, Tia Sales Product Designer is a superb help in getting ahead of the competition – and staying there. Tia Policy drives the processes and handling of policies. It manages the whole lifecycle, from issuing and adjustments right through to renewals and cancellations. A key aspect in any sales dialogue, Tia Policy lets you quickly create quotes and adjust policies. This means improved efficiency and a smoother overall insurance experience for both your self-service and call-in customers. Tia Products lets you create and distribute any type of product. It lowers the time and cost of bringing products to market, while also helping you reduce your number of products – making your portfolio more manageable. Tia Products eliminates dependencies on IT and puts configuration at the fingertips of your insurance professionals. Tia Claims ensures a smooth, user-friendly digital experience for your self-service customers. Your claim handlers will also be able to provide faster, more personal service to call-in customers. At the same time, they can boost productivity by taking advantage of guided automated processes to enhance service and prevent leakage. Tia Coinsurance simplifies management of your coinsured policies. Seamlessly integrated with Tia Policy and Claims Manager, Tia Coinsurance delivers a unique overview of both premium and claim cost between coinsurers. In addition, the add-on also supports complex arrangements where acquisition costs are shared among coinsurers. The use of reinsurance as a means of risk transfer is a necessary given for most P&C insurers. Tia Reinsurance lets you seamlessly manage reinsurance contracts in the same integrated system as policies and claims. You get a full overview and direct and reinsurance business within the same system. Also, your IT department has fewer interfaces/integration points to maintain. Tia REST API activates your digital insurance ecosystem. REST lets you create a completely unique digital landscape in a fast, cost-efficient way. Tia REST API makes it easier than ever to take advantage of CRM systems, external data providers, engagement solutions such as mobile and portals, INsurTech solutions and much more. Tia Risk-Based Saving is designed to support investment-based products. It can expand your product offerings by introducing a savings account into the Tia solution. Tia Risk-Based Saving can be configured to automatically trigger postings like incoming payment, life events and periodic life batch runs to a customer’s savings account. These postings can be both online or in a scheduled batch. The Tia Business Rules Designer is a cloud-based system that enhances your business by increasing your levels of automation and making it easier to connect systems. The Tia Business Rules Designer reacts automatically to business events in the transactional solutions. Its extreme flexibility makes it quick and easy to change decision criteria and alter parameters. 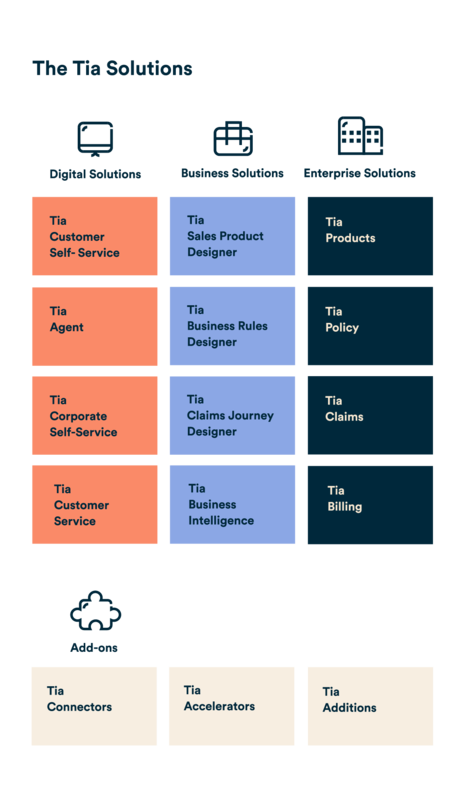 The Tia Claims Journey Designer is a native cloud solution that empowers your business by letting you design your own customer self-service claim journey. This means less time to market – and greater end user satisfaction from a speedier, more efficient claims process. It comes pre-configured with a number of 3rd party data providers and runs outside Tia Enterprise. Tia Country-Specific Connectors are local extension modules. They support connectivity to the relevant authorities, registries, financial institutions and third-party programs that you deal with in your daily operations. With our integrations, you automatically get access to country-specific functionality that adheres to the Tia enterprise coding standards and is continuously updated. Unless you’re knee-deep in setting up time- and budget-consuming data warehouse processes, Tia Business Intelligence does exactly what you want a cloud-based BI solution to do. Wave bye-bye to update blues and costly maintenance. Say hello to analytics-driven decision making. Oh – almost forgot – we also guarantee 100% data traceability.